Harem, Üsküdar and Kadιköy are the names of three neighborhoods right at the southbank of the ‚Boğaz‘ (means throat/abyss, how locals call the Bosporus) on the Asian side of Ístanbul. 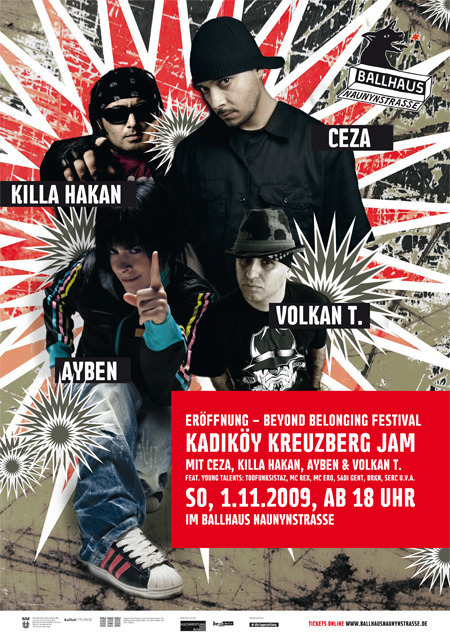 Kadιköy and Kreuzberg (Berlin) are closely connected (not only but also) rapwise. Kreuzberg is a district in former West Berlin and it’s history is very much involved with the history of Turkish working class migration and racist exclusion in germany. At the same time the district’s culture is very much shaped by expressions of so called ’second‘ and ‚third generation‘ youth of Turkish and Kurdish descent. Turkish rap actually first started in neighborhoods like Kreuzberg in different cities in West Germany in the late eighties / early nineties and reached Turkey half a decade later. The geopolitics and traditions cut short, Ayben is not from Kreuzberg but one of the pioneering MCs in Harem/Üsküdar/Kadιköy (Istanbul). She had her first contribution recorded in 2000, when her brother Ceza and Dr. Fuchs as Nefret taped Doğru Olan Zordur (‚It’s hard to be good‘) and she sang the backup vocals. Like many other Turkish speaking rappers from Germany and Turkey, Ayben built relationships to artists and crowds in both countries. She had several shows in Kreuzberg, like for instance at the Beyond Belonging festival 2009 and furthermore recorded and performed together with Killa Hakan, Volkan T and Microphone Mafia.